furniture, with these cute Scottie Dog Coasters. Getting people to use a coaster can be an uphill battle, but when the coasters are this adorable people will just be drawn to use them. The background for the Scottie silhouette is the colorful red plaid that most people associate with Scotland. The coasters are made of thin cork so that they are absorbent and easy on the environment. The only way these could be cuter to me would be if it came with my clan tartan . . . and maybe a Scottish Fold cat. But I wouldn't say no to the dog. Just sayin'. Happy Scottish Pride Day! 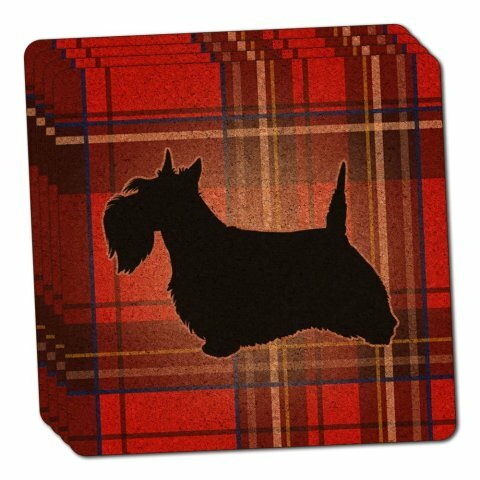 To order your Scottie Dog Coasters, click here.